John Dale Limited undertakes the contract manufacturing and packaging of private label baby wipes, wet wipes, facial cleansing wipes, skincare wipes, self tanning wipes and facial tissues. We offer a comprehensive range of high quality products made to your specifications. Why Us for Private Label? John Dale Limited has earned a solid reputation through the manufacturing of quality products that meet or exceed customers’ expectations while maintaining strict confidentiality to protect your ideas and intellectual property. We are keen to work with you to develop bespoke private label solutions for your wipe and tissue requirements. Our experienced personnel will be happy to work with you to develop a successful product or product portfolio. Confidentiality is guaranteed. Through our manufacturing of private label products we have formed a real partnership with our customers. Our production facilities are rigorously inspected and accredited by many major UK retailers. We have the privilege of being accredited to manufacture private label products for distribution throughout the UK. John Dale Limited is able to develop private label products for our customers using our own in house formulations or alternatively to use your own specific liquids and substrates to meet your needs. All of these products can be manufactured as private label with your own logos and branding. The minimum order quantity for printed film packaging is fifty thousand repeats. We can help you select the ingredients and substrates to use, in order to ensure that your wipes are perfectly formulated for the chosen skin type and purpose. 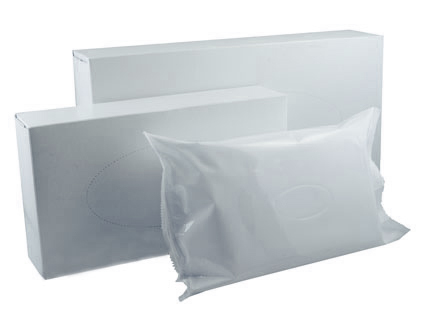 John Dale Limited is able to provide you with your desired specification of facial tissue at the right price to achieve a value for money product. We are able to give you our recommendations on packaging design and form.